An interview with singer – songwriter Ian Foster. Karen: Ian, if I were to visit you in St. John’s, the city you call home, and had just one day, what would you want to show me during the visit? Ian: St. John’s, Newfoundland has a few #1s, so the tour would involve those. It’s the oldest city in North America, and also the most easterly. So, I would show you the ocean, which is easy to do where I live – it can be seen just minutes from my home in the downtown core of St. John’s. I would take you to Cape Spear, which is about a 20 minute drive outside of the city, and show you the most easterly point in North America. I would show you Signal Hill, site of the first transatlantic wireless transmission. Karen: On your most recent album “The Great Wave” there is a song titled If the Weather Holds. While this song is about more than weather, it is notable that Newfoundland is not a place for wimps. How has your island’s extreme weather impacted your song writing? Ian: I’m from the urban centre in Newfoundland, so we don’t see the same extremes as some of the remote parts of the island. I do often think that places with harsher climates can yield especially good art – maybe it’s because we’re inside during the snowstorm strumming a guitar instead of lounging on a beach in the sun! Karen: When you are songwriting do the lyrics or melody typically appear first? Ian: It depends on the song. Sometimes the music will come first and will hang around without words for a while. Sometimes someone will tell me a story so compelling that I’ll lyrically have a fully formed song without music almost immediately. On occasion, they both evolve together, informing the other. No matter what – there has to be a strong relationship – one has to fuel and push the other. Karen: You attended the 2014 Northeast Regional Folk Alliance (NERFA) conference and this is where you became acquainted with Lancaster-based musician Jake Lewis. How important are conferences like NERFA for musicians? Ian: Conferences can be extremely important for musicians. This tour will see my first shows in PA, MA, MD, WV and NY. About half of the shows on this tour came out of NERFA somehow, whether that was directly from presenters or from meeting like-minded musicians like Jake. Of course, there is a risk for the musician – they can be expensive weekends, and there are no guarantees. In all of those cases, musicians are literally paying to play in the hopes that it will generate work down the road. Exposure is an important factor, as everyone says, but – as the saying goes – you can die from exposure! It’s all part of the ‘business’ side of music. Karen: You have a love of storytelling. Do you come from a long line of storytellers? Ian: My father is definitely a man interested in stories. I did a history minor in university, and I remember there being a big difference between academic history and the history as my father told it. Academic history places such a strong emphasis on statistics, dates and facts. Obviously, those things are important, but sometimes, academic history can stop there. My father loves facts (he could tell you the .mm of a certain bullet used by the allies in a particular gun in WWII), but he also loves anecdotal tales. That one little story which tells the big story; the one that connects us to those before us. That’s something that made me love history, and then made me love telling the little histories I sometimes tell in song. Karen: Thanks Ian for taking the time to answer these questions. 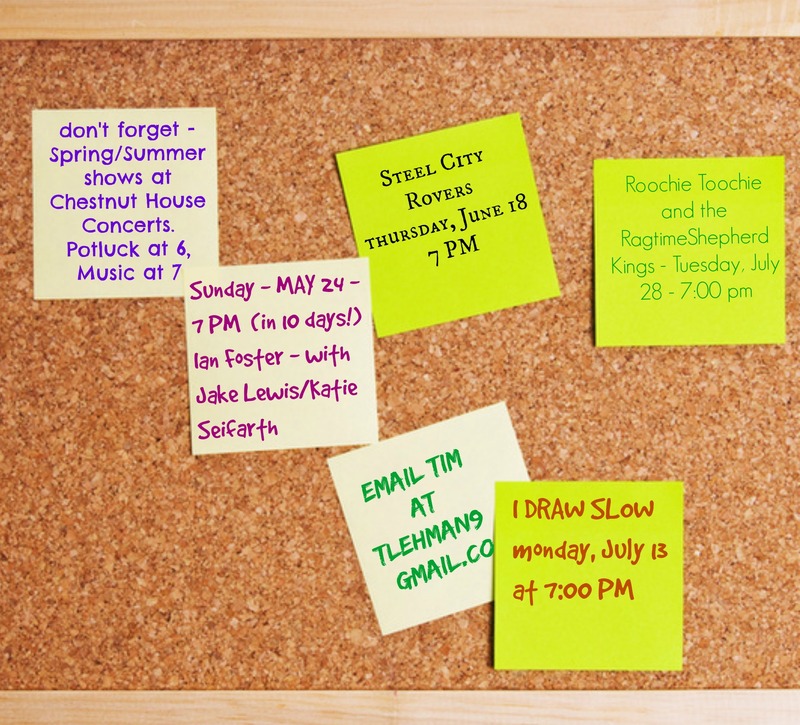 We look forward to hearing your music and your stories on Sunday, May 24, 2015 at Chestnut House Concerts. If you’d like to attend this house concert, contact Tim at tlehman9@gmail.com or by phone/text at 717-9409311. Potluck at 6 pm, Show at 7 pm. 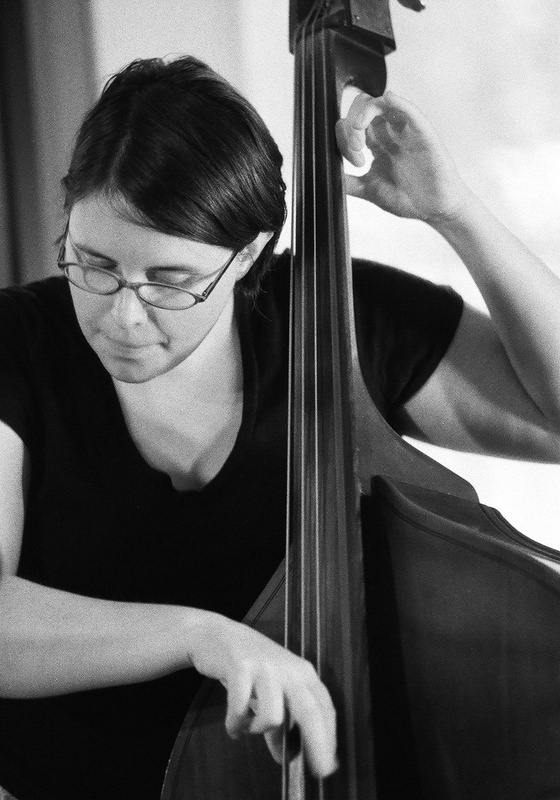 Upright bass player Kirsten Lamb of Cold Chocolat e, a Boston based four-piece band that played at Chestnut House Concerts last summer, graduated from the New England Conservatory with a Master’s in Contemporary Improvisation. Congratulations Kirsten! 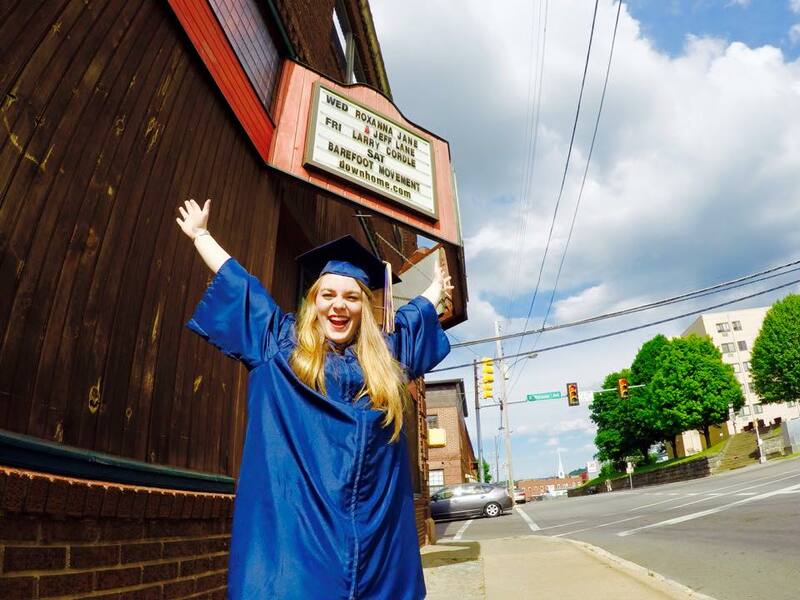 Another female bass player – Hasee Ciaccio with The Barefoot Movement graduated with her bachelor’s degree from East Tennessee State University. We know how hard she worked to make this happen – way to go Hasee! Tania Elizabeth and her husband Andy Stack (playing together as The Stacks) were at Chestnut House Concerts in June 2013. Tania has been playing with The Avett Brothers and Andy’s band Buffalo Stack has been gaining popularity after great reviews of their album “Buffalo Stack”. The band is working on their second recording. Andy was featured in the May 2015 issue of Vintage Guitar. No Depression, the leading voice in American roots music since 1995, premiered a video by Mandy Fer and Dave McGraw called “Tide Moon Ship Horn”. We’re hoping to have Dave and Mandy return to Chestnut House Concerts before the end of 2015. They were received well in 2013 and their most recent album Maritime is getting great reviews. 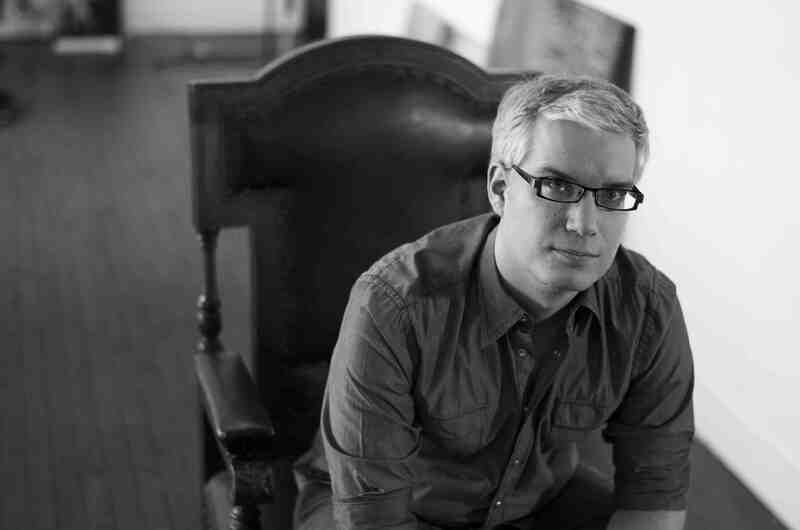 Chestnut House Concerts presents Ian Foster on Sunday, May 24, 2015 at 7:00 pm. It’s not a school night since Monday is a holiday. No excuses. Call/text Tim at 717940-9311 or email at tlehman9@gmail.com to reserve a seat. Opening songs by one of Lancaster’s favorite duos, Jake Lewis and Katie Seifarth.